Robin May and Ed Downham took ASH25 13 to Switzerland for the last week in May and the first week of June. The weather was at times excellent and permitted some stunning flying. Longest flight was around 850kms after attempting a 1000km out and return to Wiener Neustadt in Eastern Austria from Schanis. The weather deteriorated around Zell am See in Austria, returning to Schanis effectively completed a 500km out and return, where a further 350km triangle taking in Andermatt, St. Moritz and the Engadine was completed. After 4 days in Schanis we moved on to Samedan in the Engadine valley where we had a further 2 good days, the last one resulting in a cross country terminating back at Schanis. 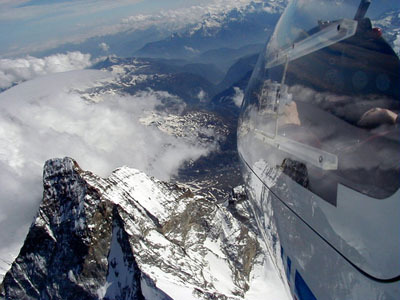 A move to Sion in the South West of the country gave a further stunning flight which gave us an opportunity to take a close look at the Matterhorn and Mont Blanc. Click on the picture and be patient whilst a map of Switzerland loads. Some of the best photos from the trip can be seen by clicking the blue spots.